BlackBerry already released its financial report for the latest fiscal quarter and apart from the information that gave us insight about the company's current budgetary condition, another interesting piece of news got revealed. It seems that the heavily-rumored BlackBerry Q30 (also known as Windermere) will eventually see the light of day this September. This was unveiled by BlackBerry's CEO, John Chen, who confirmed that the high-end device will be unveiled at an event in London. However, its name won't be Windermere, like it was expected, but Passport instead. The Passport will most probably come with a square-shaped display, which will be bigger than 4 inches and will sport a peculiar resolution of 1440 x 1440 pixels. Should this turn out to be the case, the BlackBerry Passport will be rocking a pretty high pixel density, allegedly around 480 ppi. The upcoming BlackBerry device is also believed to pack 3GB of RAM, a 13MP back snapper, and a removable battery with the monstrous capacity of 3450mAh. 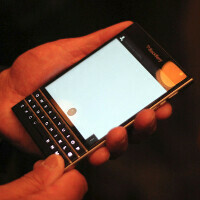 The BlackBerry Passport will also come with a QWERTY keyboard, which is reportedly functioning like a trackpad. So, could the Passport be one of the devices that will help John Chen turn BlackBerry into a profitable company? We will find out only after the BlackBerry Passport hits the shelves. Looking forward to more big screen phones from BB. This while it is not for me, should satisfy some nicely. Keep the fight going BB! Im so getting this device. I like the size and specs. Plus with android apps coming from amazon to bb. This will be a hit I can see it now. with that square-ish resolution?? good luck on using the apps on amazon ecosystem. some of the apps will not run perfectly on this phone. you better get the real mccoy... the real android handset, rather than some phone that trying to immitate/copy/steal android name. And how do you know the apps won't work on this device? Have you tried it before? Let me answer that for YOU: NO. You haven't tried ANY BB10 device before, so you cannot speak from a position of knowledge about them, only ignorance. And Amazon's ecosystem is one of the BEST in the business. Again, you have NO IDEA what you're talking about. Dude! Again, don't be harsh on yourself, and call yourself nobody. Even if you are a hater I for still consider you somebody. I would prefer a 16:9 screen ratio for watching video. But I will at least look at it if an AT&T LTE model is available. HOW IS IT THAT YOU HAVE A JOB WITH PHONE ARENA AND YOU ARE POSTING A PICTURE THAT IS NOT THE BLACKBERRY PASSPORT. THATS NOT THE PHONE. THATS A FAN CONCEPT RENDER. Probably Googled the name and the first picture that popped was used. "Because...Because...Because..." Lmao! What? You had trouble thinking up one of your lies? You must not be able to read, because BlackBerry posted a better quarter than the last! The stock is up! The shorts have retreated! John Chen has silenced so many haters! And instead of you just admitting it, you ramble on with your lies. I feel sorry for you. BB is a commando like john rambo down but never out. i cant wait till they knock some socks over of microsoft and make them eat their own p000p mixed with elop peeeeeniz its going to be a great karma session for microsoft who played a great game in destroying a great company and stealing all the patents. cant wait till b----itch fanboyz going to cry a river when purview only snaps pictures of BB ejaaaaaaculating all over th face of micro--dik and flop. commando like john rambo?? in your dream pall... in your dream..... bb is like a leper who were crawling for their last moment. and we just hope it stop crawling. it hurts seeing bb suffering and no body cares about them. even their fan just giving moral support but not buying the phone anymore. Great phone, great specs! Can't wait until it's release in September! Peter change the picture please! That's NOT the passport! Judging by the number of favorable comments maybe it should be. The CEO of blackberry just officially released the phone blackberry passport and classic (Source crackberry.com), the passport looks almost similar to the pic. "They will not save company..." Um, what? Have you even READ their latest quarterly report released today?? BlackBerry is well on its way to being profitable again, so the company IS saved. Where have you been the last 13 hours? Under a rock? BlackBerry's losses are only down 1% compared to last quarter. Still up to spreading your lies, I see.